OK. We're going to spend the next few minutes talking about household appliances. Not so much about how they can refrigerate your food or wash your clothes, but rather, how they help us understand the current trade dispute between the U.S. and China. NPR's Alina Selyukh explains. ALINA SELYUKH, BYLINE: Home renovations. If you've done one, you know it can be exasperating, time-consuming, expensive. And Jani Mussetter is doing more than a renovation. She's doing a remodel - bathrooms and a whole new kitchen. JANI MUSSETTER: It really was daunting, the whole experience. You know, I bought everything. I bought a washer, dryer, a refrigerator, freezer, dishwasher, a range. SELYUKH: And as she was going to showrooms for all these appliances in January, this stressful thing kept coming up. MUSSETTER: The moment I walked in, everyone pretty much warned me that February 1, everything was going up. SELYUKH: As in going up in price. And because Mussetter was shopping on the higher end, that could mean hundreds of dollars. MUSSETTER: They said because of all of the tariffs. SELYUKH: The tariffs. They've been making a huge impact on the cost of appliances in the U.S. Take Whirlpool. 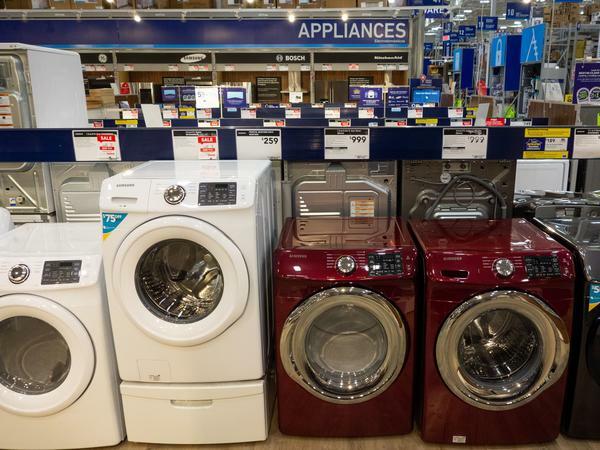 It's a leading American appliance maker, and Whirlpool prices barely changed for years, says Alvaro Lacayo, housing analyst at G.research. ALVARO LACAYO: And then when you look at what happened in 2018, you saw a big tick upward. LACAYO: That LG and Samsung had been dumping appliances into the U.S. market at below cost, rendering competition irrational. SELYUKH: And last January, President Trump agreed with Whirlpool. He set a new hefty tariff on imported washing machines. Selling washers to Americans became more expensive for foreign companies, and domestic manufacturers, like Whirlpool, could finally raise prices. But then Trump imposed more tariffs - on metals, like aluminum and steel, which is critical to building almost any appliance. Suddenly, appliance makers everywhere, including Whirlpool, began complaining about the rising cost of raw materials. They had little choice but to start hiking their own prices. STEVE SHEINKOPF: On certain products, you could be looking at a 14 to 16 percent increase from last year to this year. SELYUKH: Steve Sheinkopf owns Yale Appliance and Lighting in the Boston area, and he's been in the industry his whole life. SHEINKOPF: I'm the third-generation owner. Yeah. We're here in Boston and have been here for almost a hundred years now. It's hard to believe. You know, I haven't been here all hundred. SELYUKH: But, you know, about 1/3 of that. Sheinkopf says many brands he works with, like Wisconsin-based Sub-Zero and Wolf, or German Thermador, they regularly inch up their prices. But in the past year, the increases have been bigger than most. Now overall prices of major appliances, tracked by the Labor Department, are starting to tick down month to month, but they are still higher than they were last year. SHEINKOPF: When you talk about machines that people want to buy, front-loaders, I think you're looking at $200 to $400 difference versus last year. SHEINKOPF: I think this is the biggest challenge they'll ever have. SELYUKH: And Mussetter, who is remodeling her house, she did manage to buy all her appliances before the February price jump. She later learned that saved her more than $1,200. Alina Selyukh, NPR News. Transcript provided by NPR, Copyright NPR.